Our success comes from working side-by-side with our clients, helping them identify the right solution for each challenge. Doing it all with integrity, tenacity, and a genuine passion for the work is what sets us apart. In 1983, Peter Scott decided to take management consulting down a fresh path, and he formed the firm that would become known as ScottMadden. From his first client relationship, Scott did everything in his power to exceed expectations on every project. This is where the relationship model that would define our company was developed: Clients’ needs always come first, and ScottMadden will serve them as a trusted advisor for the long term. By the end of the 1990s, the firm had eclipsed 1,000 projects, and our areas of expertise had expanded to include shared services. 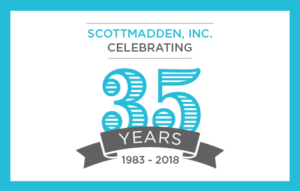 Even with this expansion and diversification, ScottMadden continued to be known for creating results that set businesses up for success. We pride ourselves on our collaborative approach—truly engaging clients, working side-by-side to produce results. One of the keys is flexibility in our service delivery. ScottMadden consultants sit down with each client to determine their needs and then personalize the work to focus on the things most important to the company’s success. We do more than just solve problems—we solve the right problems in the right way. Putting the clients’ needs first, everytime, this approach is the heart of the firm today. In 2000, with the same spirit that Scott established in 1983, ScottMadden continued to evolve and grow under the new leadership of Brad Kitchens. As clients’ needs evolved, areas of expertise expanded and practice areas were added to meet the changing needs. Today, ScottMadden delivers a broad array of consulting services from strategic planning through implementation across many industries, business units, and functions. The firm’s practice areas include Energy, Clean Tech & Sustainability, Corporate & Shared Services, Grid Transformation, and Rates, Regulation, & Planning. The firm’s client retention rate is a source of pride—our very first client is still with us today, 35 years later. When clients engage ScottMadden, they work with genuine people who know what they are doing and love doing it. The ScottMadden team believes that client success is the most important measure of our own success. The pride of 35+ years of a job done right is only matched by the excitement of what the future holds. How can ScottMadden help you?